Blockchain "is not meant to wipe out existing legacy systems," said Maria Palombini, director of communities and initiatives development at the IEEE Standards Association. In most cases, the idea is for the network approach to supplement IT applications and innovate the ways they manage data. That's what Massachusetts General Hospital is hoping, for instance, with the partnership announced this past month with MediBloc, a Korean blockchain startup. The aim is to pilot new DLT-based storage and exchange mechanisms that complement, rather than supplant, its existing electronic health record. The hospital plans to "explore potentials of blockchain technology to provide secure solutions for health information exchange," said Synho Do, director of MGH's Laboratory of Medical Imaging and Computation. "When you think about all the data (in and EHR), what do you put in it? Genomic data, hospital records, immunization records, lab results – there's an enormous amount of data," she said. "The question then becomes, ‘Do I have to do this over and over every time I go to the hospital or I go to my doctor?'" We could soon see a world where "everything you have in your health record gets put into the blockchain, and then the patient is managing their health record," she said. "I have my health record, and then I go to my doctor I give him a token to access my records." In a lot of ways, EHRs represent an ideal application for distributed network tech such as blockchain. As Drexell Neumann a Weill Cornell Medical College medical student explains, it may even be a "panacea" to some of their longest-standing challenges: interoperability and security. "Blockchain’s open access would enable changes to an individual’s EHR (new imaging, procedures, labs) to be updated in real time on an EHR blockchain and instantly available to parties involved in an individual’s care (health care providers, pharmacies, insurance companies, the patient)," he said. "No more issues with compatibility of different EHR systems or waiting for faxes." Moreover, "using a decentralized ledger in EHRs also means data cannot be held ransom," he added. "Each user has an updated copy of the blockchain, thus hackers cannot obtain control over the ledger and hold it ransom as WannaCry did to many providers in 2017." Writing for the Harvard Business Review, longtime Beth Israel Deaconess Medical Center CIO and blockchain enthusiast Dr. John Halamka, says the technology could help address the "vexing problem" facing health systems everywhere: "how to share more medical data with more stakeholders for more purposes, all while ensuring data integrity and protecting patient privacy." It has to do with blockchain's structure – enabling a new paradigm for dat a exchange, he said. "Traditionally, the interoperability of medical data among institutions has followed three models: push, pull, and view," Halamka said, "each of which has its strengths and weaknesses. Blockchain offers a fourth model, which has the potential to enable secure lifetime medical record sharing across providers." The potential for blockchain to revolutionize data exchange along these lines is described in detail in a 2016 case study coauthored by Halamka and BIDMC colleagues with MIT Media Lab. "Imagine that every EHR sent updates about medications, problems, and allergy lists to an open-source, community-wide trusted ledger, so additions and subtractions to the medical record were well understood and auditable across organizations," said Halamka. "Instead of just displaying data from a single database," he explained, "the EHR could display data from every database referenced in the ledger. The end result would be perfectly reconciled community-wide information about you, with guaranteed integrity from the point of data generation to the point of use, without manual human intervention." This and similar approaches are already at work, with startups such as London-based Medicalchain, which develops distributed ledger technology to store patient health records as "a single version of the truth" able to be accessed with appropriate permission by physicians, hospitals, labs and insurers. In a post on Medium, the company highlights the benefits of such an approach: "Data can only be accessed by the patient’s private key; even if the database is hacked, the patient’s data will be unreadable (it’s all encrypted); patients have full control over accessing their healthcare data; patients will control who sees their data and what they see; instantaneous transfer of medical data, where every member of the distributed network of the health care blockchain would have the same data for the patient; there’s a reduced risk of errors, and better patient care." Medicalchain already has high-profile partners such as the NHS and Mayo Clinic, which announced its plans to work with the company on several EHR use cases earlier this year. 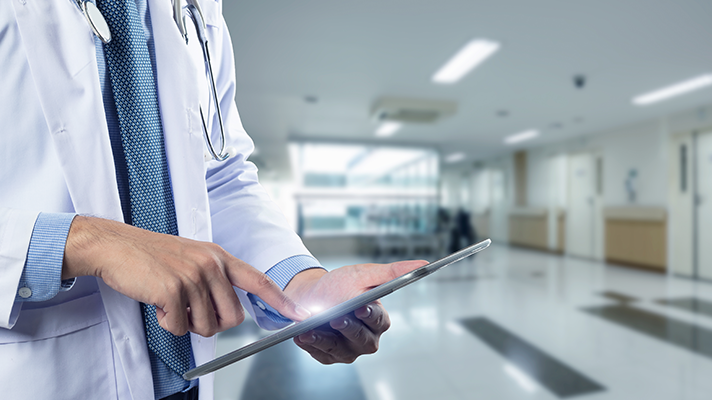 In a recent interview with HIMSS Europe, Dr. William Gordon of Harvard Medical School said that while much of the excited discussion around blockchain is "still hype, particularly when it comes to clinical data," the technology "is promising for EHR data in a few ways." That said, big challenges remain, said Gordon. "First is the sheer volume of clinical data," he explained. "Blockchains as they exist today are not designed for storing large amounts of data, such as would be generated during a clinical encounter." Second, he said, "blockchain relies on some form of a unique identifier to link records across individuals, which means identity will have to be managed somewhere to de-duplicate patient IDs." And third, Gordon explained, "identity on blockchain tends to be anonymous but not private. What this means is that while transactions are anonymous (real identity is hidden), they are publicly recorded. Once an individual’s identity is linked to a blockchain identifier, their entire history of transactions is available – which could be catastrophic for clinical data. There are mechanisms to mitigate these issues – for example, 'private' blockchains that aren’t public, or storing data 'off-chain' – these issues need to be addressed more fully before we see widespread EHR data sharing via blockchain." Still, he said, "the challenges around blockchain are surmountable, and there is a tremendous energy around finding the right use cases in healthcare. Additionally, the underlying technology is changing rapidly, with protocols suited to different verticals being developed."